it's hard to get a good picture because it was so long! but the hot dog vendor made the party! 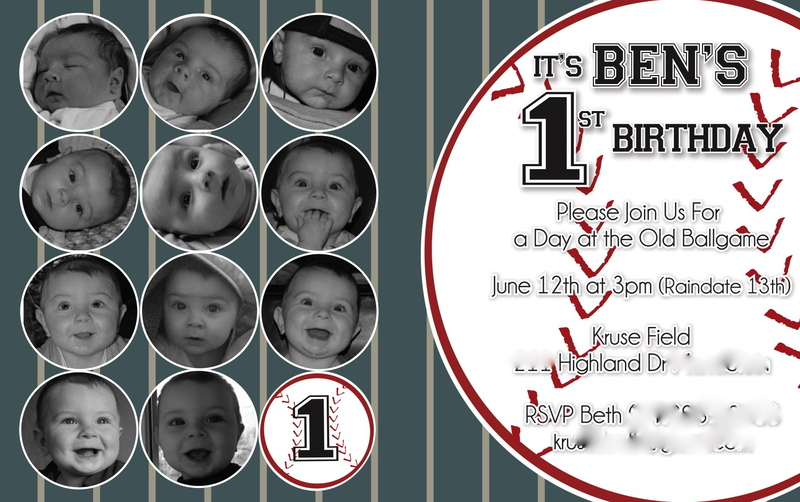 and then around the ball says "i am one" & "birthday boy"
she also made the custom shirts from ben's birth announcement. it was very rainy all day so i didn't get to decorate the yard as much as i would've liked. but it didn't rain during the party so i'm not complaining! Wow!! Fabulous party!! You did a great job!! That is an amazing party! Luckt little guy! Love the theme! What a DARLING party!! Adorable theme!! Love all the little details! Thanks for sharing!! What a lucky little guy! Love the baseball chair! Where did you get it?! Whoa, this is great! I love everything. 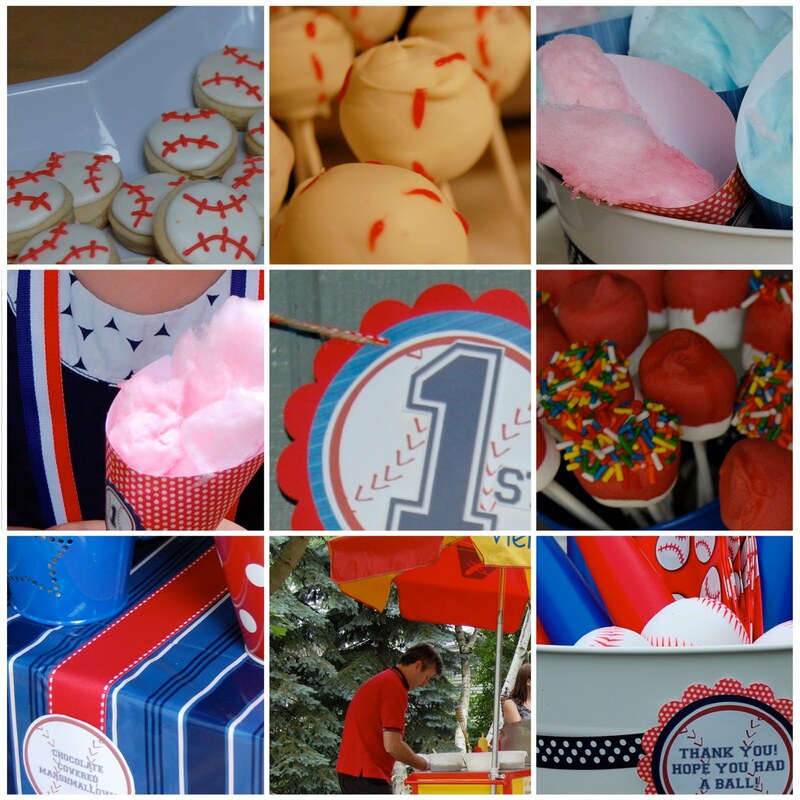 The home plate cake, the baseball chair, the hot dog vendor- it looks like so much fun! the chair is from homegoods. love it although every one we could find had a rip in it! it was too cute not to get though! I'm your newest follower from New Friend Friday! I love the theme of the party! I wish someone did all that for me when I turned 1...lol. Following you back from NFF. What a great party for your little guy!! You really had a lot of great details. Love it! Everything looks like it was awesome!!! I would've loved a party like that! So much creativity. Very cute! I saw this on Kara's and loved it! great job!! Everything is incredibly cute! What fun ideas. Precious! I love baseball themed parties!!! Great job! What a beautiful beautiful party!! You got every little last detail down! Where did you find the baseballs & bats? I'd live to give those out as favors for my sons party in a couple weeks. Thanks for sharing, you've inspired me beyond belief (didn't even know I had it in me ;) so thank you, Beth!!! Oh, and where did you find the cotton candy? Did you buy indiv bags and just open them up to put into the cones? What a great presentation!! Hi Beth. Not sure if you saw my comment but would you mind sharing where you found the baseball bats you gave away as favors? Thanks!! mrsxoxo1598- i sent you an email awhile back. i guess you didn't get it? i got the bats and balls at dollar tree. i also got some balls at the party store. if you email me at bethkruse23@yahoo.com i will send you my original email. sorry! thanks for the info beth! i thought they looked like the ones i found at dollar tree... too bad they're all sold out :( oh well, thanks anyway. Awesome baseball party! Where did you get all of your tags, banners and such? My son turns 1 in March and we're doing a baseball theme and I love everything about your party! !